The audio edition of my journey to fish professionally! Follow my journey through the ranks of tournament bass fishing with the hopes of fishing at the highest levels! How to Catch Fish in Deep Water - Jig, Carolina Rig, Drop Shot, and reaction baits! How to Fish a Football Jig - Fishing Rods, Reels, Jig Trailers, and more! Interview with FLW Pro - Cody Murray - Discussing his road to pro, Lake Toho, Sam Rayburn, and more! Follow my 3rd and 4th days of practice out on Lake Havasu, where the fishing was tough once again. The largemouth and smallmouth bass did not want to bite, but I managed to catch a couple. The winter bass fishing in January on Lake Havasu was very tough. If you feel compelled in helping me obtain my dream to fish professionally, and want to donate to the podcast please follow this link: https://anchor.fm/matt-luna-fishing/support Sign up for my email list: https://mailchi.mp/5004b19052f0/mattlunafishing You can also follow me on Facebook, and Instagram: Facebook: Matt Luna Fishing Instagram: @mattlunafishing Much of my content is also available in video form on YouTube! https://www.youtube.com/channel/UCJ9qjSvmA_KqPaPU_PFCwJg? 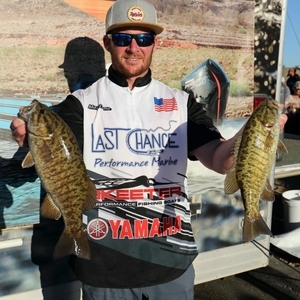 The 2018 WON Bass US Open at Lake Mead is the biggest bass fishing tournament in the Western United States, where the best fisherman chase largemouth and smallmouth bass with the chance to win a prize package over $100,000. The first day was cancelled due to weather, and the event was shortened one day. The fish were dealing with weather changes. Overall I had a decent showing for the tournament. I finished in 71st place out of 224 boats, and missed a check by barely over a pound! I'll be there next year for sure! Hope you enjoy the episode! In this edition of the Matt Luna Fishing Podcast, I take you through the 5 days of practice I had out on Lake Mead for the WON Bass US Open. Five days goes by very fast out on Lake Mead. It is a huge fishery. The next podcast will take you through the actual event! I am on the road heading to Lake Mead for the 2018 WON Bass US Open tournament. Lake Mead is located very close to Las Vegas, Nevada. I was driving out for practice, and was staying at Temple Bar Marina for a majority of the practice time. I share a little bit of information about the US Open, and what I am expecting for the event. Professional fisherman sacrifice much more than people realize. They are away from their families a lot of the time. I had to make my own sacrifices this past year, and this video is my take so far. This video is not me complaining or feeling sorry for myself. What I'm trying to document in the video is the reality of what it takes to try and fish professionally. The road to get there is no easy, and it will not get any easier. I'm okay with that, and I know I will have to have patience to achieve my goals! Q&A #3 - Become a pro, Sight fishing, and more!! In this episode I am opening a recent tackle warehouse order. I bought some topwater baits and some braided line. Listen in to find out why I bought these items and what I'm hoping to achieve with them. Thanks for listening! In this episode I am discussing the new ned rig bait by X Zone Lures, called the Ned Zone. I really like this bait, and think it is an awesome compliment to any ned rig jig head. If you want to get your own or see the different colors they have available be sure to go to their website at xzonelures.com. If you're interested in the ned rigs I make contact me on Instagram, Facebook, or email. Instagram: @mattlunafishing Facebook: Matt Luna Fishing Email: mattlunafishing@gmail.com I also have Keep Casting sticker available for purchase! Check them out on Facebook or Instagram. Contact me to purchase one! Thanks for listening! Keep Casting Sticker, Ned Rigs, Summer plans, and more! In this podcast I am talking about the new Keep Casting stickers that I have made and are ready for YOU, I am talking about the Ned Rigs I make and giving you and up close and personal description of them! I also discuss summer plans for this summer, and where I am at with the possible sale of my boat! If you are interested in buying a sticker or ned rig please contact me on Facebook, Instagram, or Email! Facebook: Matt Luna Fishing Instagram: @mattlunafishing Email: mattlunafishing@gmail.com Payment goes through PayPal! Thanks for the support! Checking In, Thanking Everyone for their Support, and the future! In this episode I discuss what I've been up to lately, that my boat has been in the shop, why I make and sell tackle, thank everyone for their support, and I discuss the future of this season! Also follow me on Facebook, Instagram, and YouTube at Matt Luna Fishing! In this edition of the Q&A, I am discussing my opinion on information sharing, baitcasting reels, what the hardest part of tournament fishing is and how I stay positive, and what got me into fishing. I hope you enjoy the episode! In this edition of the podcast I participated in the OEF/OIF Warrior Bass Tournament at Diamond Valley Lake. It was awesome taking out a veteran and an active duty marine. It was a great event and a good way to give back to those who give us so much! In this episode, I talk about my recent tournament on the California Delta, and what the future looks like going forward for me. This Delta event may be the last one of the year, but not the last one ever! This is the audio version of my 2018 Series episode at the Wild West Bass Trail Pro/Am on the California Delta. I had never been to or fished the Delta prior to this event. It is a giant fishery, and the fishing for this event was tougher than I expected it to be. It ended up being a tough event over all, but I learned a lot and would look forward to another event there! Thanks for listening. In this episode, I am on the way to the California Delta for the Wild West Bass Trail Pro/Am event. I talk about how this may be my last pro/am of the year, and how I think the tournament is going to shape up. This the question and answer edition of the Matt Luna Fishing podcast! In this episode I answer 4 questions I received from either Facebook or Instagram. I discuss helpful hints about ned rigs, my favorite bait, my go to bait, and what I eat on the road! Hope you enjoy! If you want your questions to be answered go follow me on Facebook at Matt Luna Fishing and Instagram @mattlunafishing. This was the second stop on the Wild West Bass Trail for the 2018 season. Unfortunately this was a tough event. There were some monster bags weighed in. I had never seen the lake before practice, and couldn't find the big bites. I learned a lot, and continuing to move forward in my journey to become a professional angler. If you want to watch a video version of this podcast check out my YouTube channel at Matt Luna Fishing. I'm also on Instagram @mattlunafishing and Facebook at Matt Luna Fishing. Thanks for listening. Another tough event for me. I struggled to catch the right size fish. I'm still in the learning, and I'm continuing to learn each tournament. I should have bed fished in this event, but unfortunately I fought what I knew to do based on the conditions. I had a small limit on day one and then only managed to bring in 3 fish on day 2. If you want to see a video version of this podcast check out my YouTube channel: Matt Luna Fishing. I'm also on Instagram @mattlunafishing and Facebook at Matt Luna Fishing. Thanks for listening. This is the second day of the Wild West Bass Trail Pro/Am on Shasta Lake. This tournament was a struggle for me. I caught a ton of fish but couldn’t find the right bites to do well! The is the first event of my 2018 Season. The event took place in January at Shasta Lake. This was a pro/am tournament that was put on by the Wild West Bass Trail. In this edition of the Matt Luna Fishing podcast, I am on my way home from a pre-practice trip out to Lake Mead in August 2017. I give a recap of the trip! I’m not a professional yet! Thoughts about other people’s unsupportive opinions about me putting out content and why documenting my journey is something I think people want to follow!